According to the recent Plank observation , non-baryonic dark matter (DM) comprises ~26% of the universe’s mass energy . Distinguishing the DM signal from the astrophysical contribution is the key to indirect detection of DM . Dark Matter Particle Explorer (DAMPE) published the highly accurate measurements of cosmic ray electron flux between 25 GeV and 4.6 TeV. A sharp peak exist at ~ 1.4 TeV. The decaying-DM model adopt to explain the unexpected peak . The decay products of the local DM subhalo could contribute to the DMAPE peak with = 3 TeV and τ ～ s . The local DM subhalo should not be beyond 0.2kpc form solar system with m = .We also obtain constraints on DM lifetime and the distance of the local DM subhalo by comparison with DAMPE data. 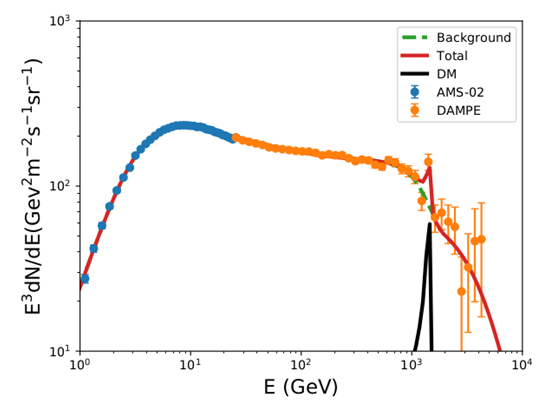 Fig.1 The CR-electrons plus positrons flux with best-fit parameters,compared with the AMS-02 and DAMPE data.